All numerical results in this report are based on data from telephone interviews conducted by Princeton Survey Research Associates International between August 9 and September 13, 2010, among a sample of 3,001 adults, age 18 and older. Interviews were conducted in English and Spanish. For results based on the total sample, one can say with 95% confidence that the error attributable to sampling is plus or minus 2.5 percentage points. For results based on internet users (n=2,065), the margin of sampling error is plus or minus 2.9 percentage points. For results based on caregivers (n=860), the margin of sampling error is plus or minus 3.9 percentage points. In addition to sampling error, question wording and practical difficulties in conducting telephone surveys may introduce some error or bias into the findings of opinion polls. A combination of landline and cellular random digit dial (RDD) samples was used to represent all adults in the continental United States who have access to either a landline or cellular telephone. Both samples were provided by Survey Sampling International, LLC (SSI) according to PSRAI specifications. The landline sample for this survey was designed to generalize to the U.S. adult population and to oversample African Americans and Hispanics. To achieve these objectives in a cost effective manner, the design uses standard list-assisted random digit dialing (RDD) methodology, but telephone numbers are drawn disproportionately from telephone exchanges with higher than average density of African American and/or Hispanic households. 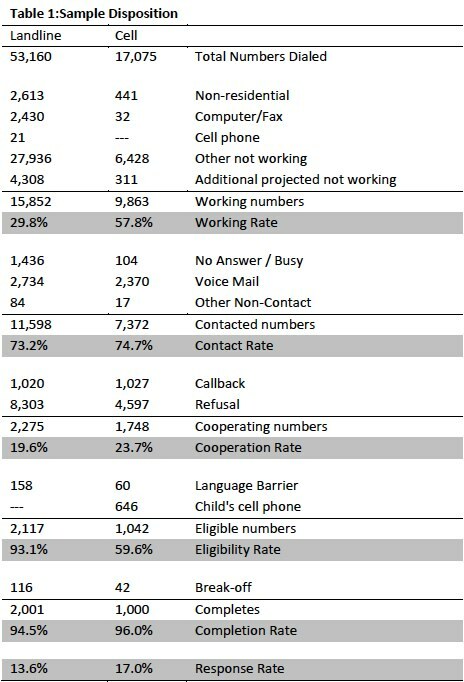 The cellular sample was not list-assisted, but was drawn through a systematic sampling from dedicated wireless 100-blocks and shared service 100-blocks with no directory-listed landline numbers. Thus the response rate for the landline sample was 13.6 percent. The response rate for the cellular sample was 17.0 percent.